Many of us create new content over and over again, wasting precious time we can be spending on other aspects of our business. One of the things I learned from the top leaders in my industry is sequence marketing. This is using and reusing content, stacking upon stacking the same content over and over again. Using it in different forms. Blog posts, social media, pulling quotes from them, doing a FB live on it, podcast episodes, tweeting and retweeting, etc. Most entrepreneurs and business people already have a ton of content created. Just take a look at most blogs. So to make life easier for myself and my clients, I like using the same content over and over again. But many don’t know just how to go about reusing the content. 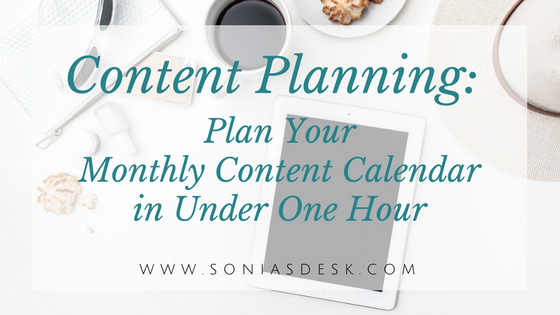 So today I’m sharing the exact process I use to schedule a monthly content calendar in under one hour. Creating a storyboard. First and foremost, decide the type of content you want to share. 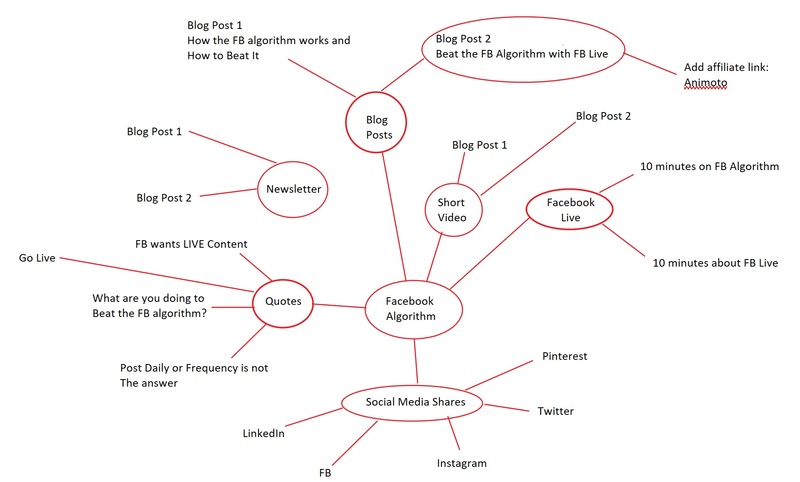 Consider what the Facebook Algorithm will push out to your audience the best by reading up on how the Facebook Algorithm works in this post. I come up with the theme for the month first. In my case, last month was all about the Facebook algorithm and how to beat it, with the number one tactic being Facebook Live. Next, decide how many blog posts you’ll do for the month. Whether that’s once a month or once a week, decide what each blog post will be on. Remember to keep it in line with the theme of the month. Then start plugging it into a mind map or calendar. I’ve used a mind map but it just makes it more confusing for me because I like to incorporate dates and prefer a calendar view. However, many find them quite useful and effective. This is what my mind map might look like, plus a date next to each one for me. Instead, I simply take a blank calendar template and start writing in it. Like the one in this example. Yes, I do it by hand, and do a lot of editing (scratching out), swapping, moving around, etc. I first start by inserting holidays, or any special events for that particular month, so I can schedule around that. I add my blog posts next, then when the newsletter goes out, social media shares, when I’ll do FB Live, blog quotes, Sonia quotes, outside links I’m going to share, convo starters, etc. Every checkmark, color, lower case, CAPS, star, period and circle has a meaning in my head, that only I understand because I’ve been using them since I was in college. I keep this calendar pinned on my board right in front of my desk once it’s completed so I can reference it daily. Then it’s time to start creating. Again, I write my posts first, so I can pull quotes from them, and create graphics. My Facebook Lives are currently a recap of the blog posts for those that don’t have time to read. And everything else just falls into place leaving little to room for scrambling at the last minute. Once done creating, you’re ready to schedule everything. Personally, I don’t have a lot of blog content for my business. But in the case of clients, I go back and pull content from 4 to 5 years ago. Especially for those that are evergreen, and simply make some edits to bring it up to the current year, and I schedule to republish it. You can make things even simpler and create a theme for each day. For example, Motivational Monday, Testimonial Tuesday, Woman Crush Wednesday, Throwback Thursday, Fun Friday, Self Love Saturday, and Soul Searching Sundays, to make your social media shares that much easier to come up with. The goal is to have at least a whole month done before the month begins. I’m almost there. It is the last of the month today as I’m prepping this blog post to go out next week. Just as soon as I get done with this blog post, I’ll start on the next blog post. Then I’ll spend time on graphics to share on social media. And if you’ve ever visited my Instagram, you’ll see there’s a plan to how that looks too, making my choice of graphics very precise so everything falls into the right pattern. This would not be possible without planning in advance and taking holidays and events into consideration ahead of time. As mentioned, I keep this calendar pinned on my board, but I also write reminders on my planner for the whole month so I remember every day when I look at it whether I need to do a FB Live or post to Instagram since those are not scheduled but actually done and/or shared that very day. 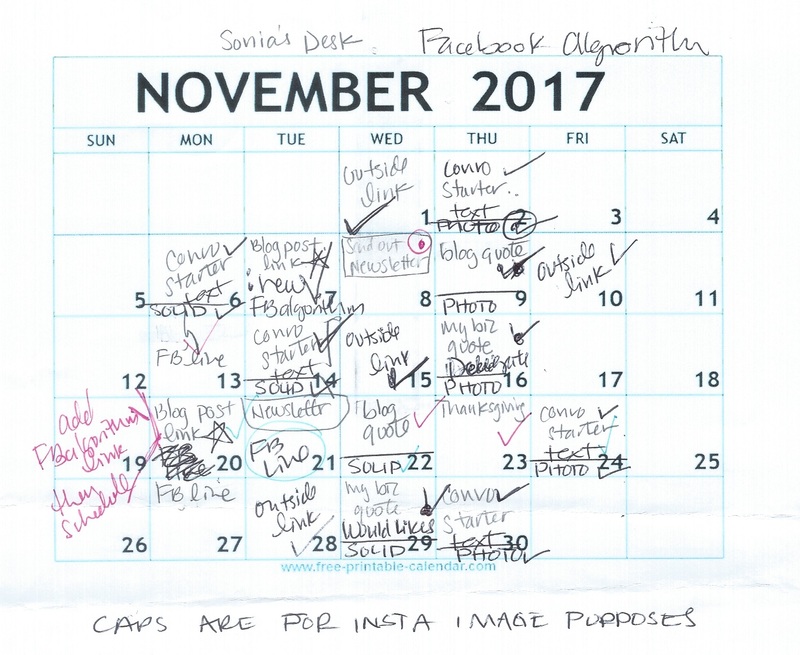 That should give you a pretty good idea how to move forward creating next month’s content calendar without feeling overwhelmed AND do it in under one hour. It’s totally doable to plan your month in under one hour flat. Yes, writing or repurposing your blog posts and creating your graphics may take longer, but having a plan will streamline the entire process. I’ve even created a sample content calendar you can use with suggested daily social media posts so all you have to do is plug in content. I’ve left enough room for you to fill it in as you please. To get your Monthly Content Calendar instant download, fill out this form now. So how do you go about planning your monthly calendar? Do you plan in advance, or do you find yourself flying by the seat of your pants every day trying to figure out what to post? Would love to know. Post your comments here or feel free to do so on my Facebook page.